Posted on: July 14th, 2009 and is filed under Brokerage Recommendations. “The 14 days Moving Average of Cipla is at Rs 256. On the daily charts, the stock is in buy on RSI and its 14-days RSI is currently at 70 (above 50 is consider to be in strong hands). The stock is looking strong on the daily chart and has formed a Trend Reversal Pattern on EOD chart. One can buy it at around Rs 267.60 with closing below stop loss of Rs 256 for a target price of Rs 280-285,” said the report. “Buy ITC between Rs 210-212 with stoploss of Rs 199 for a target of Rs 228,” said the report. Note: Recommendation validity period is 1 week. Stoploss is on a weekly closing price basis. “On the daily chart, Grasim has formed a bullish Price channel. In the above pattern, the stock slopes up and is bound by an upper and lower trend line. The upper trend line marks resistance and the lower trend line resembles support. The lower support line was formed from third week of June 2009. Subsequent lows confirmed the support line. The upper resistance line is drawn from second week of June 2009 onwards. Since then, the stock has been moving back and forth between the two parallel lines. On Monday, the stock rallied by 2% confirming the bullish set up. We expect the stock to break past the critical resistance levels of Rs 2,478. The other supportive technical oscillators are positive and the upmove may extend to the levels of Rs 2,570 and Rs 2,590. We recommend traders to buy the stock in the range of Rs 2,430-2,460 with a stop loss of Rs 2,390 on all long positions,” said the report. “After testing the low of Rs 259, DLF bounced back to form a Doji for the day. Further it is also testing the lower band of the falling channel. A breach of immediate resistance at Rs 375 could take prices up on relief rally towards Rs 290-300 levels. Buy DLF above Rs 275 for target of Rs 290-300 and keep stop loss below Rs 263,” said the report. The company has secured an order for the main plant package for an upcoming Thermal Power Project in Jharkhand. BHEL has secured an order for the main plant package for an upcoming Thermal Power Project (TPP) in Jharkhand, involving one new-rating unit of 270 MW. Valued at nearly Rs6.4bn, the order for the greenfield power project, located in Jamshedpur district, has been placed on BHEL by Adhunik Power and Natural Resources Limited (APNRL) reflecting the customer’s confidence in the company’s technological excellence and project execution capabilities. Coming close on the heels of an order for a 600 MW thermal power plant of Korba West Power Company Limited in Chhattisgarh, this order is testimony to the confidence reposed by Independent Power Producers (IPPs) in BHEL’s capabilities. It also reinforces BHEL’s leadership status in the execution of thermal power projects involving supply of state-of-the-art equipment, suited to Indian coal and Indian conditions. Significantly, private sector customers have been reposing confidence in BHEL and in fiscal 2008-09 itself, orders worth over Rs.130,000 Million were placed on the company by Jindal Power, Jaiprakash Power Ventures, GVK Power, Hindalco, HPCL Mittal Energy Ltd., Adani Power, Tatas and ACC, among others. Even in the current fiscal, around 80% of the orders booked so far in the power sector are from private sector customers. BHEL’s scope of work in the present contract envisages design, engineering, manufacture, supply, erection and commissioning of Steam Turbine, Generator and Boiler, along with associated Auxiliaries and Electricals, besides state-of-the-art Controls & Instrumentation (C&I) and Electrostatic Precipitators (ESPs). “ONGC is testing its rising testing drawn across prior bottoms of Rs 637 (5 Mar) and Rs 802 (15 May). As long as the rising trend line holds true, ONGC can edge higher towards Rs 1040/1060 levels. 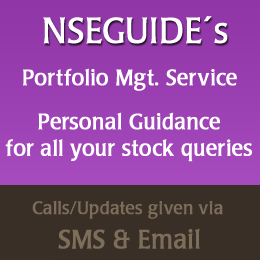 Buy ONGC on dips for target of Rs 1040-1060 and keep stoploss below Rs 960,” said the report. “Buy Reliance Infrastructure on dips with stop loss of Rs 920-880. Resistance is seen at Rs 980. If it maintains above this level then look for a target of Rs 1030-1065. The stock has corrected 30% from its recent top of Rs 1345 to low of Rs 951. Major support exit at Rs 820,” said the report. Posted on: July 13th, 2009 and is filed under Brokerage Recommendations. KRChoksey has maintained its buy rating on Infosys Technologies with a revised price target of Rs 1824 in its report dated June 10, 2009. “Infosys Technologies Q1FY10 net profit at Rs 1,302 crore was 13.2% higher than guidance of Rs 1,349 crore and well above street estimates. This was mainly aided by operating margin improvements of 367 bps to 34.1%. The operating performance was led by a deferral of specific sales and marketing expenses by a quarter. We have witnessed delays in growth on the back of deteriorating business cycles and worsening global economy variables and hence maintain our cautious view on IT industry. We maintain our ‘BUY’ rating on Infosys and revise our price target to Rs 1,824 after factoring its recent out-performance, proven execution abilities and better cost management abilities, and strong cash flow in challenging times makes it the most favored player in the IT Industry. In the event of any significant correction in the stock price, we would be buyers,” says KRChoksey’s report. Karvy Stock Broking has maintained its buy rating on Jubilant Organosys, with a price target of Rs 210, in its report dated July 13, 2009. “Jubilant Organosys has set a goal to grow its revenue and profit by 1.5x and 2x respectively in the next three years which will be on back of greater asset efficiency. The company has set a target of 30 % ROE for FY 2013E. We downgrade our EPS for FY 2010E by 16.3 % to Rs 18 and by 3 % to Rs 26 for FY 2011E on account of lower other income, higher interest cost, amortisation on account of foreign currency translation reserve and higher tax. We decrease our price target by 2.3 % to Rs 210 based on 8x FY 2011E. The overhang on stock does remain on account of the FCCB repayment of USD 270 mn by CY 2011. We maintain our ‘BUY’ rating on the stock, with price target of Rs 210,” says Karvy Stock Broking’s research report. Sharekhan has maintained its hold rating on Infosys Technologies with a revised price target of Rs 1,880 in its report dated July 10, 2009. “For Q1FY2010, Infosys Technologies (Infosys)’ consolidated revenues declined by 2.9% sequentially to Rs 5,472 crore. In dollar terms, the revenues were almost flat at USD 1,122 million and were significantly higher than its guidance (USD 1,060–USD 1,080 million). This was due to 1% improvement in the reported realisation, largely on account of favorable cross currency movements (in constant currency realisation dipped 0.9% sequentially). The volume dropped by 1.1% sequentially in line with our expectation. The operating profit margin (OPM) improved by 58 basis points sequentially to 34.1%, which is significantly above expectation. We maintain our Hold recommendation on the stock with a revised price target of Rs 1,880. At the current market price, the stock is trading at 17.4x FY2010 earnings estimate and 16.5x FY2011 earnings estimate,“ says Sharekhan’s report.